The Churn was disrupted recently. I got a call Thursday night from the ER in Westchester—those of you with elderly parents may be like me: when the phone rings at night I think Uh Oh. Not good. It’s like those phone calls from school when the kids were little: “Your son is okay, but…” I arrived at the hospital 90 minutes later, to find my 83-year-old mother looking like she’d just been in a prize fight: blood and huge black bruises all over her face, and she smiling at the attention, explaining in her southern drawl that she was just trying to cut a few cosmos when she miss-stepped and bang! A face plant in her rock garden. On Friday I took her home with me to New York City for a few days. My dad is in Italy, and as always, he prepared a number of dishes for her and put them into the freezer. One was a magnificent quart of his marinara sauce, which I brought back to the city to serve on our first night. Edward’s marinara is sweet and light, but I have two adult children living at home these days, and I felt I needed to richen it up. So I made a quick batch of ricotta (it takes less about 10 minutes), and served the pasta with a garnish of ricotta and chopped basil. I set aside the quart of leftover whey, and put a bag of dried cranberry beans in water to soak overnight. The next day we planned to go Long Island but I didn’t want to rush Mom, and so we tooled around the loft. 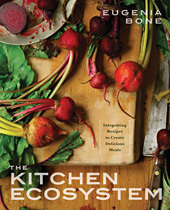 I am in the midst of post partum depression: The Kitchen Ecosystem hit the stores about 10 days ago and as Kevin reminded me, I always get the blues around the time a new book comes out. I lose confidence and get all existential about the future. Which means that I am only capable of doing stuff like organizing the Tupperware cabinet. I did manage to cook the beans in a couple of pints of vegetable stock I had in the pantry, and shoved the cooked beans in the fridge. We didn’t get to the cottage until around 5pm, which was plenty of time to cook dinner. My friend and colleague Pam Krauss joined us with her dog Venus, who is very furry and nutty. She has a passion for potato chips, which she stole from the bowl on the cocktail table and then politely ate one at a time. I poached pork loin in the leftover whey, with rosemary and bay to flavor the sauce, and made a green salad. I also poached 2 pears in cheap white wine, with a tablespoon or two of chopped baby ginger—the veal of ginger—that I’d bought in the Union Square farmer’s market earlier in the week. 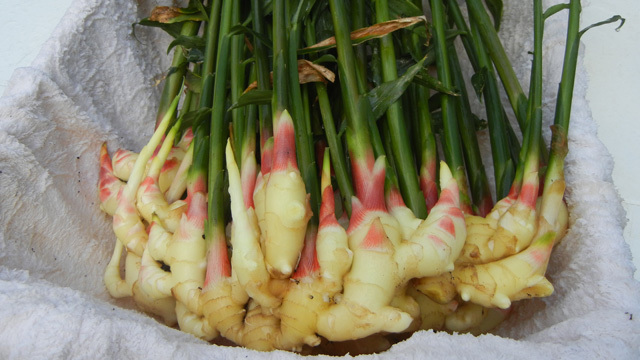 Baby ginger is creamy white with vibrantly colored pink shoots, like a breakfast radish. In the last few years, baby ginger has emerged as a specialty crop in the continental US. The plants are grown over the summer and the baby ginger is harvested in the fall. The entire crop is sold regionally to restaurants and at farmer’s markets at premium prices between $7 and $20 a pound. It’s costly, but so worth playing around with during its short, short season. We returned to NYC Sunday evening with a huge cauliflower and a quart of cranberry juice I’d made that day–future churn fodder–and pretty much as soon as we got home I made pasta e fagioli with the cooked beans, garlic, marjoram and lemon juice, and a salad of fresh tomatoes, red onions, and lots of green olives, a really spunky combination. I was surprised dinner came out so well, because that night I was on edge and distracted: from the corner of my eye I kept seeing my mother catch herself from falling over and over again. The loft we live in is mostly open space, so I could hear my Mom tiptoeing around at, like, 4am Monday morning, clearly ready to hit the road and get back to her own home. On the drive out (more like 8am) I tried to convince her to anticipate falls, to avoid tiring herself, to use her cane, but it just pissed her off. This is a whole new reality for me. I mean, I want to help, but I have to walk this fine line where I don’t tread on her dignity. Honestly, I feel like we are lurching from one near catastrophe to the next. I left her alone in Westchester—she practically kicked me out of the house, so eager was she to be on her own again–and was in a state of anxiety all day. I couldn’t put my mind around cooking, but luckily I didn’t have to. Some friends asked us to join them to hear John Hiatt at the City Winery. He sang Have a Little Faith in Me. I hadn’t heard that song in years. I don’t remember it making me cry before. Place the milk and salt in a large, heavy bottomed pot. Slowly bring the milk to 185°F. Take the milk off the heat, add the vinegar and stir it in. The curds will precipitate promptly. Allow them to form, a couple of minutes. Have ready a colander lined with cheesecloth placed over a large bowl. 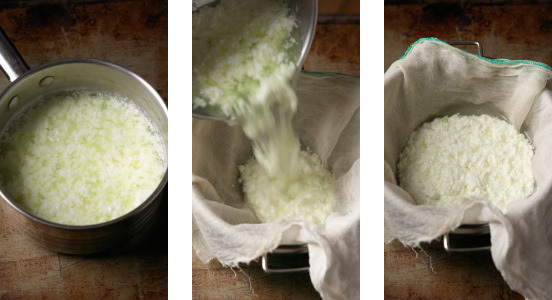 Pour the milk and curds through the cheesecloth. Save the milk for another use. 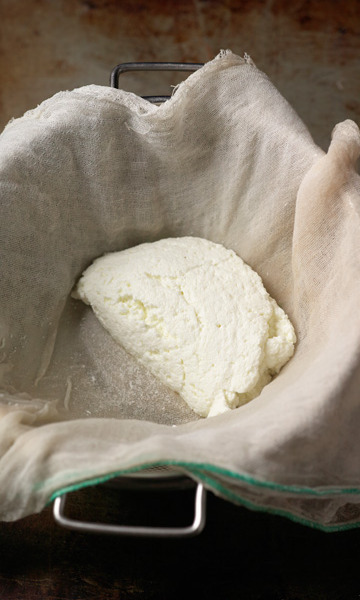 Allow the curds to drain for an hour or so, then squeeze the curds in the cheesecloth and pack in a bowl. The ricotta holds for a couple of days in the fridge. You can flavor this pork with garlic and sage is you prefer. The pork is wonderful served on mashed potatoes and smothered in the sauce. Cut the tenderloin into two or three pieces and season them well. Heat the butter in a medium sized Dutch oven or other heavy bottomed pot over a medium heat and add the pork. Sear the pork all over, about 10 minutes. Add the shallots, rosemary, and bay. Add the whey. Allow the whey to come to a boil, and then turn the heat down to low, so that it boils very gently. Partially cover and braised the pork for an hour or so, until the pork is very tender. Remove the pork and keep warm. Reduce the whey, uncovered, until there is only about a cup left, a few minutes. Serve the pork sauced with the whey. Remove the meat and keep warm. Bring the sauce back to a boil over a medium heat and reduce by a third, about 15 minutes, scraping up any browned bits from the bottom that might be left over from searing. Remove the rosemary stem and the bay leaf. Adjust the seasoning. Slice the pork and serve with the milk sauce. You can use any sort of pear, even little Seckels, though I usually choose Bosc. Select pears that are not yet table ripe: very ripe peas may disintegrate during poaching. Place the pears in a low pot with a fitted cover. Add wine, sugar, baby ginger, cloves, bay, and lemon zest. Cover and poach over a medium heat for 10 minutes until the pears are tender. Remove the pears and set aside. Reduce the liquid and spices for a few minutes to thicken. Strain the syrup and add to the pears. This is such a beautiful post. Jo Ann recently finished shooting a large photo project in the northeast and came home with the same post partum haze, thinking she needed to move on from photography. I shared similar insight with her about how the time just after book releases makes me feel the same way. She recently spoke in CT to 400+ girls at Miss Porter’s school about her art and is now thankfully crawling out of that space. 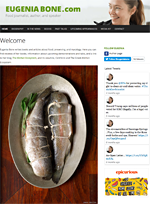 Love how the kitchen ecoystem remains vibrant and manages to connect people (in addition to meals) in times of stress.